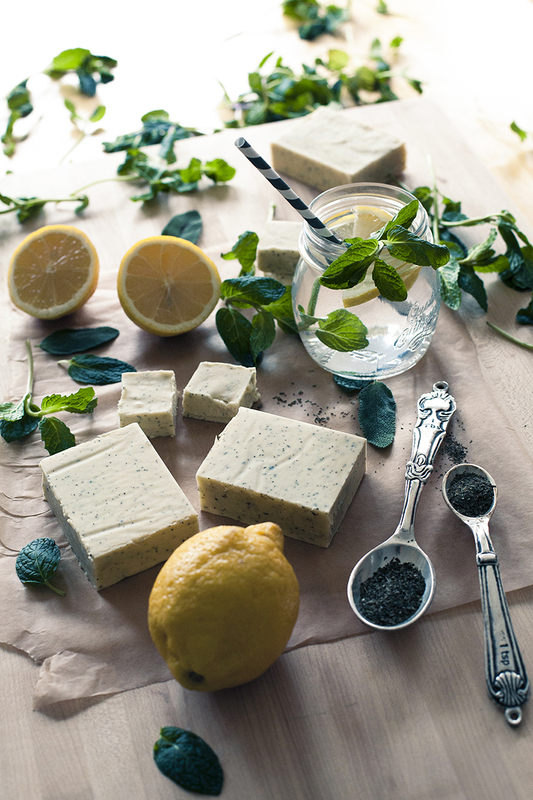 Today, I'm bringing you a very special post from the lovely, Tiffany, on how to create your own homemade lemon herb soap. She blew me out of the water with this fantastic recipe, and I can't wait to try it myself. Take it away, Tiffany! Hi everyone! 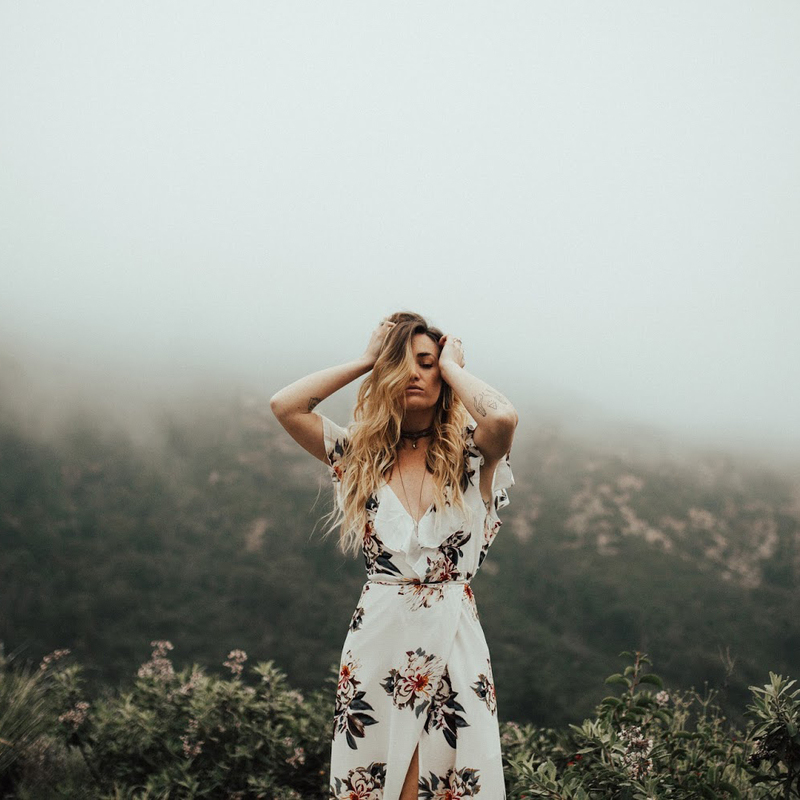 I'm Tiffany from the blog, offbeat and inspired, and I'm so excited to be posting on SK today! Soap making has been a hobby of mine for a few years now, so when I found out Kinsey was doing a Clean Living series, I was so excited to share some of my soaping experience with you! Pursuing a homemade lifestyle can get a little overwhelming. When I first started "going clean", I decided to focus on food and body. In the body category, I made a list of my products ordered by frequency of use. 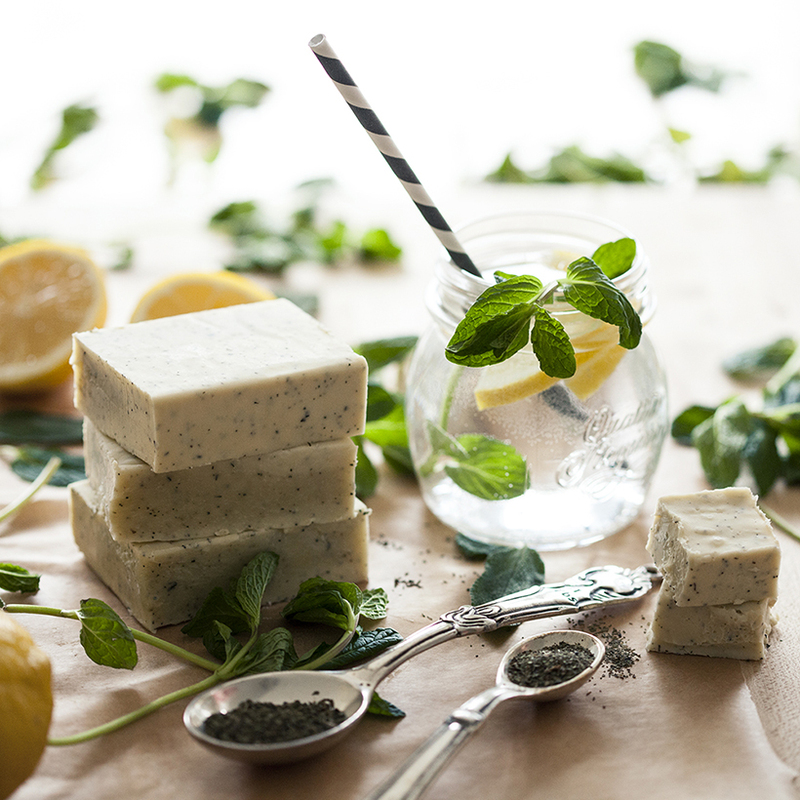 Soap came in at the very top of the list, so I started researching and was SO pleased to learn that making your own healthy soap at home is not only possible, but easy! There are many methods of soap making, but Cold Process is the one I like best. The actual "making" time takes about 2 hours, and then you have to let your soap cure for about 4 weeks. The cure time allows moisture to completely evaporate from your soaps so that they're fully hardened for use in moist environments like the shower. To learn more about Cold Process (CP), check out my extensive soap making tutorial HERE. Because there's so much to know about soaping before you get started, I highly recommend checking out that tutorial before starting on the following recipe! 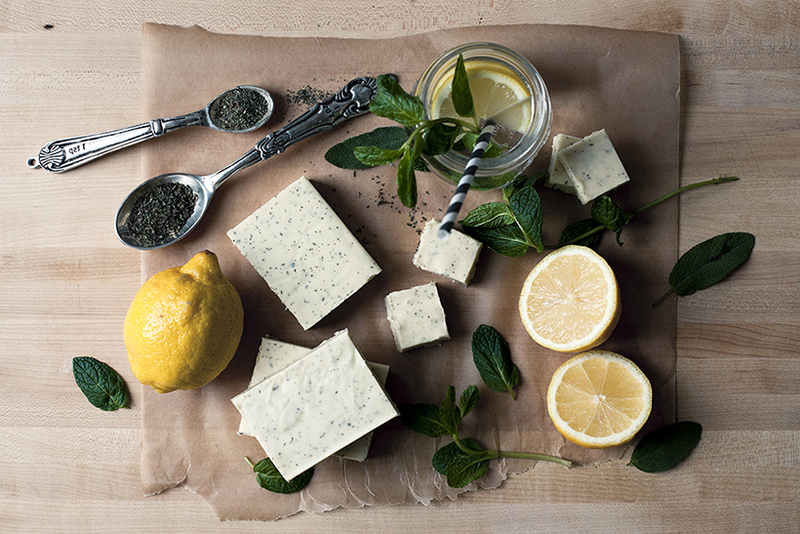 I created this Lemon Herb Soap recipe whilst dreaming of springtime. I wanted something fresh with a bright zing and a light exfoliant to wake me up during my morning shower. I LOVE how this batch turned out, so let's get to it! Warning: because Cold Process soap making requires the use of lye (a caustic substance that can cause burns), pay special attention to keeping your skin protected, and do not inhale directly over the lye. Work in a well-ventilated room, and keep the kids and pets away while you're soaping! 1. Put on your rubber gloves, goggles and mask. On the scale, measure 8.5 oz. of water into the measuring pitcher. Set the scale back to 0, and sprinkle 4 oz. of lye into the water. Stir the mixture for 30 seconds to 1 minute so that the lye is fully dissolved. Cover the pitcher with a lid or aluminum foil and put it in a safe place to cool. You want the solution to drop below 125 degrees F.
2. On the scale, add the Olive Oil, Canola Oil and Coconut Oil to your large bowl. Microwave the bowl of oils on high for 2 minutes. The Coconut Oil needs to melt fully. You can remove the bowl while there are still pieces of coconut oil, and stir to fully melt. Set your bowl of melted oils on a table and let the temperature drop below 125 degrees F.
3. While you're waiting for your Lye Solution and Oils to come to temperature, line your soap mold with parchment paper and tape or clip the sides so the paper stays put. Once your Lye Solution and Oils have dropped below 125 degrees F (but are still over 100 degrees F), add the Lye Solution to the Oils and mix with your stick blender on a low setting. Make sure the stick blender stays near the bottom of the bowl to avoid splashing. You'll be mixing for about 5 minutes and the soap mixture will be thickening. At this point, you are looking for "trace". Trace is when the mixture has thickened to a pudding-like consistency. If you lift the stick blender out of the mixture, it should leave light marks on the surface. 4. Once you reach trace, add your Essential Oils and Dried Herbs. 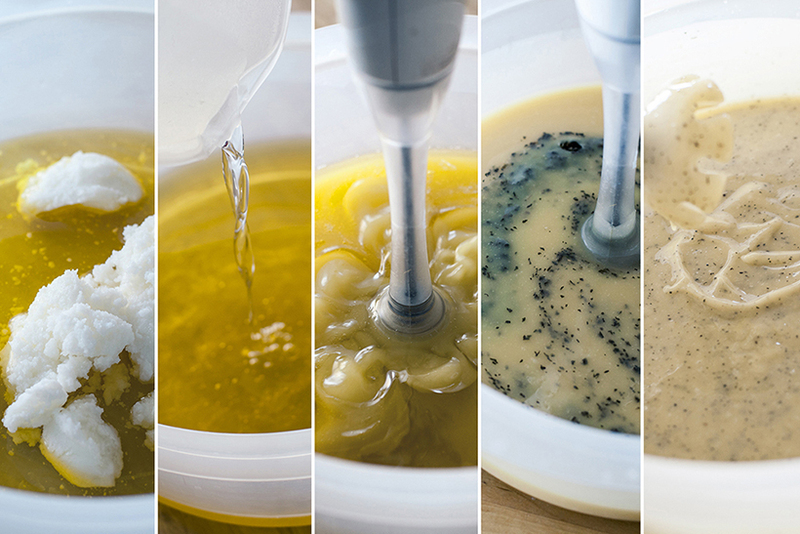 Continue mixing with the stick blender until the Oils and Herbs are fully incorporated into the soap mixture. 5. Pour your soap mixture into your mold and tap the mold on the counter a few times to let any air bubbles escape. Even out the surface of the soap with the back of a spoon like you would with brownies. Cover the mold with aluminum foil and let it sit in a cool, dry place for 24 hours. 6. De-mold your soap loaf and cut it into whatever shapes and sizes you prefer. Once they're cut, I like to place them on a parchment-lined cookie sheet with a label specifying the date and scent so I can keep track of cure times. You should wait 4 weeks before gifting or using the soap in the shower, but after 2 days the bars should be set enough to test them out in the sink. I hope you enjoy this recipe and even though making your own soap may seem intimidating, do try it out. 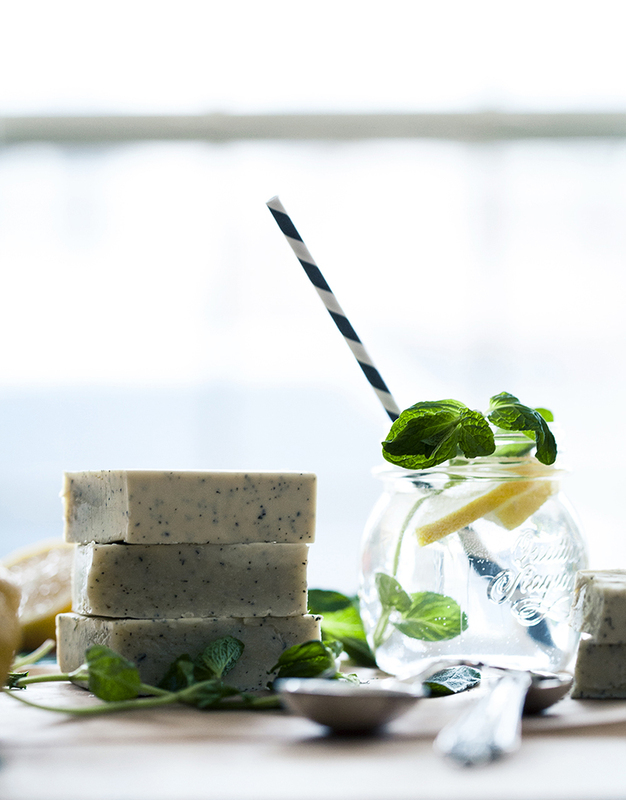 Once you give homemade soap a whirl, you'll never go back to store-bought! Be sure to check out more of Tiffany's soap tutorials here! Another hobby that would be SO easy to pick up and love! One day I'll try it. I have been wanting to make my own soap lately, and was in need of a good tutorial - this is perfect! Thank you so much, I can't wait to try. My sister and I made soap in February using this method, and had terrific results! I will have to try this!!! Thank you for the post!! ok this looks amazing & I can't even believe how beautiful your photos are. Looks really wonderful and such fantastic ingredients. This is a great DIY and the pictures are amazing! I'm gonna share it on my blog! Awesome tutorial ! 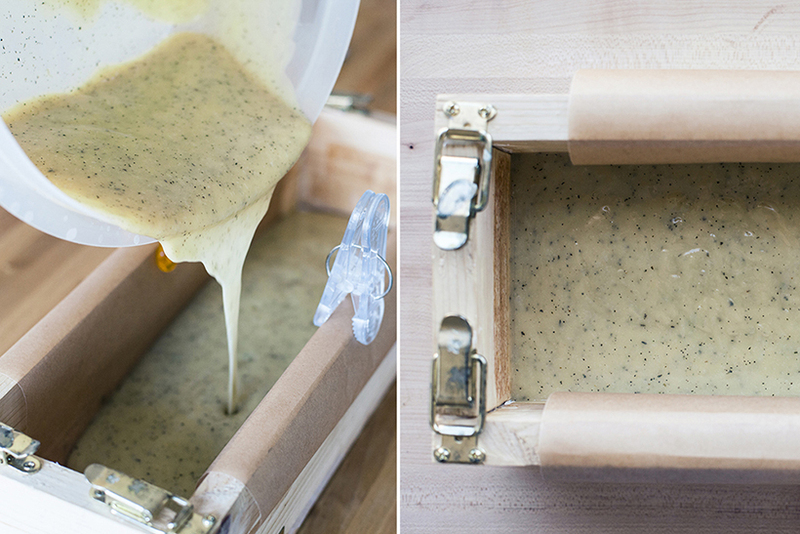 love the idea of making your own soap. Oh I can't wait to give it a try!!! This looks simply wonderful!!! Amazing! First of all, great photos, second of all, I'd love to make this! I just wanted you to know that I nominated you for the Most Inspiring Blog Award. Your blog has been such an inspiration to me as I begin my own, and I wanted to thank you. You can see the details on my blog with the link below. I have never even thought of making my own soap...until now! Awesome post! Can't wait to try it! I've been dying to make my own soap for the past couple of months and have been too nervous about working with lye... I'll definitely have to try this though! on the first picture the water with mint and lemon made me sooo thirsty lol i love this! thank you for sharing! Oh my goodness those pics of that soap make me want to get over my fear of Lye and make me some soap!! I would love to be able to make my own and know what I put into it and be able to put the scents I want in it! And your lemon & herb water looks delish! Hope you have a lovely weekend! Girls these photos are gorgeous!! Look like they're from a magazine spread. Love the ingredients you used in the soap. You are a women of many talents. This is just stunning and I love the idea of homemade soap! I love all these DIY soaps and lotions and things! Such a good gift idea, too. Glad to find such useful tutorial..I will implement these useful tips for proper cleaning of my home. wow beautiful and so natural. Loved it! I love the smell and bright green color of mint! Few drops of essential oil is best for a more balanced natural soap recipe.